Enjoy a beautiful healthy glow on your special day! Brides and bridesmaids! Worried about how you will look in the pictures on that special day of yours or your BFF's? Wonder and worry no more, Divine Sunless Tanning is here to help! Invite the whole wedding party over, serve some yummy beverages and nibbles, review details of the big day. Wendy will steal away each member of the group into a private area and turn them into golden goddesses or...god's! Fun, fast, perfect color, no streaks and lasts a good long time. ENJOY! Sherry~ Color is awesome. I already gave out your cards to my friends with my "glowing" remarks Thanks! Angie~ Loving the tans in Vegas! Color is great...Talk soon! Marla~ Hi Wendy. My color came out gorgeous! It lasted the whole trip 2 Vegas. It didn't stain my clothes nor smell bad I LOVED it! Will get it again when I get back! Danni~ Hi Wendy I just wanted to let you know that my tan turned out great and I got a ton of compliments in LA which says alot! I've already given all your cards out that you left for me. Thanks Again! Jen~Color is Gorgeous!!! love love love it. Thank you so much it was a pleasure meeting you. Liesl~ Thank you it was awesome to meet you too! The color turned out perfect! Oh and it gave me an excuse to buy a cute new dress to show off my glow! Nice. Mawganne~ Thanks so much Wendy-you're awesome and the color looks great-Love it! Hope you have a Happy 4th! Crystal B.~ Hi Wendy! The color was great, we all loved it!! Thank so much! Nicole M~ Hi Wendy, my tan turned out perfect! it looks so natural and I wish I would have looped my sister into the appt with you!! Anna B~ Wendy the tan turned out great, you did an amazing job. There are no lines or streaks and its a nice subtle tone, you really are a pro at what you do and it turned out much cleaner and more perfect than I thought was possible with spray tanning. Thank you for the great work and I will proudly sport my tan in Hawaii!! Nicole L.~ Love it!! !I got lots of compliments at Hotel 1000 spa on Saturday! 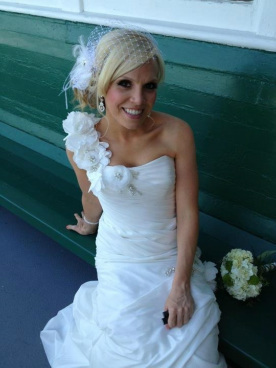 Erin B.~ Divine doesn't even come CLOSE to describing how amazing a Divine Sunless Tan looks!! Wendy is professional, considerate, flexible and very enjoyable to work with. I called Wendy last minute two days prior to a trip - not only did she fit me in (8:00 appointment after a 10 hour day) but she called, texted and confirmed several times to make sure it worked for me (her last apt. of the day ran her late). I would most definitely suggest Wendy to anyone who wants to sport a healthy glow WITHOUT going into the tanning beds! I'm thrilled to have found someone that is easy to work with and really listens to what you like and need! Don't hesitate to call her - what a great find!! ~Anna. G~ Turned out Great! thanks so much again, I will definatly be calling you before my next event! ~Rachelle~ It was Great and the pictures are so beautiful...thank you again! ~Brooke~ It looks amazing!!! Thank u so much again!!! take care and I'll definatly be seeing you again! ~Brandelyn L.~ Wendy I'm sitting outside at the UVa bar in Disneyland with the most amazing perfect tan. You have a permanent client! Its awesome and has made my day. Thank you! ~Erin W.~The tans turned out great, no issues with the heat at all. We were very impressed and will definitely see you again!! ~Doris K.~THANK YOU Wendy! I love the color! I will see you on the 7th before Brazil for sure! ~Karri L.~ OMG, I am already in love with my new beautifully tanned bod - you are a true artist!. My best girlfriend came to pick up her kidlets and was so jealous that I have found time to spend at the beach - she thought it was Au Naturale J mind you, she is one of the top makeup artists for Nordstrom so this is a major compliment. ~Lauren H.~ I am thrilled! It looks great and so natural and blended. You are a pro! Can't wait to use my 2nd session in August sometime! ~Julie T.~I have to say everyone called me the next day to say how much they LOVED their tan. Compared with the last one I had done, your spray skills are wonderful. I have no lines, no weird patches or marks. I would go a little darker next time, but I was concerned because of my last spray tan experience. Everyone also really liked you and thought you were nice and very professional. ~*Chris R.~ It was nice and even and I didn't have any issues with missed spots, streaking or uneven fading. It looked awesome with my sleeveless shirts and dress's just great thanks again!! ~*Barbie~Barbie Hull Photography ~ I had heard about spray tanning now for awhile but was afraid to try it, my experience with Wendy was FABULOUS! She came to my house and airbrushed me and my girlfriends and the results were beautiful. I am more than Happy and will tell all my friends about Divine Tan! ~*Darnell Sue~Girl Power Hour~ check out Girl about town for info on my Gal Wendy November 13th blog. ~*Nicole N.~ I just wanted to drop you a line Wendy and tell you my vacation was Fabulous and so was my tan! You did a great job and I got LOTS of compliments, the Holiday party is coming I will be calling you. ~*Kelli L.~Wendy it was great to meet you and my tan looks really great, thanks so much for a nice experience it was much better than sunless tans I have had in the past. ~*Annette E.~ The color looks great and is holding well....I love it! ~Pamela G.~Arbonne~I had my first sunless session with Wendy and I gotta say...it was a great experience!! Wendy comes to your home, airbrushes you cleans up and makes the whole experience very comfortable. I highly recommend her to all my fabulous girlfriends!